Members and supporters of 2/2 Commando Association of Australia will be saddened to learn that one of the last three surviving members of the 2/2, Fred Otway, passed away in Brisbane on the 3 April 2018 aged 97 years. The two surviving members of the unit are Keith Hayes (W.A.) and John ‘Jack’ Hanson (Queensland). Born in Pingelly, W.A., Fred was an original member of the unit and served in No. 1 Section, A Platoon throughout the campaign in Portuguese Timor. He was promoted to Corporal before the end of the campaign. 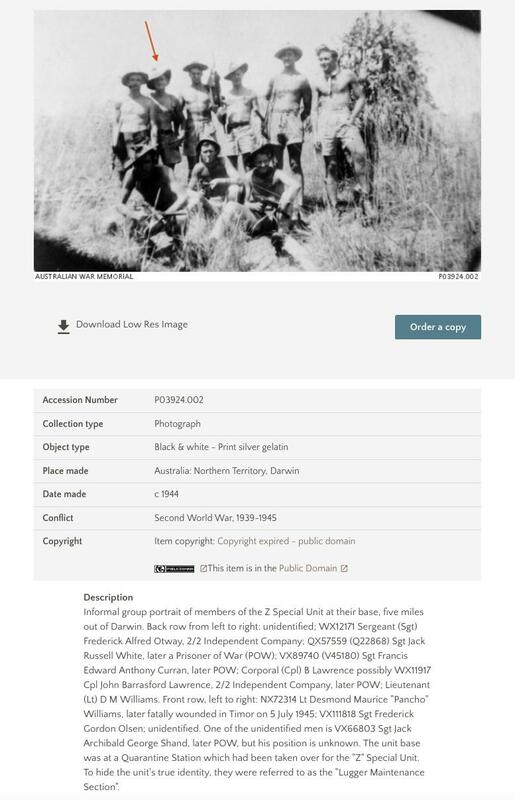 Deployed to New Guinea with the 2/2 in 1943, Fred left in June 1944 along with several other men to serve with the Z Special Unit, and after training, was based in Darwin. As a Sergeant, Fred participated in three Z Special operations to Portuguese Timor in mid-1945. Post-war Fred undertook a government sponsored training course and qualified as a painter and decorator and worked in that trade for the Queensland Government until he retired. He was an active member of the Queensland branch of the Association, from the beginning to the end, and he and his wife Ellen participated in all the safaris and reunions, including the special trip back to Portuguese Timor for the opening of the Dare Memorial Pool and Resting Place in 1969. He was a regular correspondent to the ‘Courier’ and contributed several interesting articles related to his personal life, family history and wartime experiences. In August 2012 Fred along with Keith Hayes was invited by the Department of Veterans Affairs to be a member of the Commemorative Mission Timor-Leste for the 70th Anniversary of the Timor Campaign. The Committee extends its condolences to Fred Otway’s family, salutes his service to the nation during WWII and recognises his supportive involvement with the old Association from its beginning to the end. Source: Ian McPhedran. 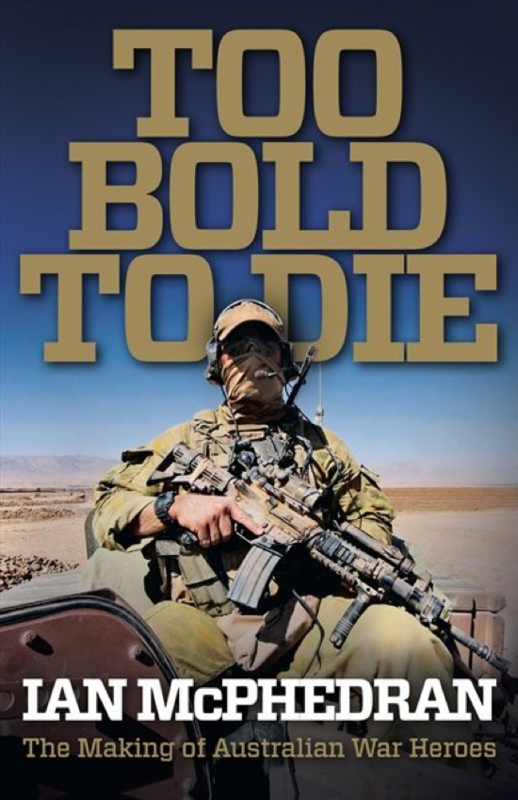 – Too bold to die: the making of Australian war heroes. – Sydney, NSW: Harper Collins Australia, 2013: 39-45. Living hard was part and parcel of Fred Otway’s life from a very early age. Little did he know as he struggled through a poverty-filled childhood that one day the hardships that had forged him would help to keep him alive in the jungles of East Timor and elsewhere as a commando and ‘Z’ Special Unit operative during the fight to save Australia from the marauding Japanese Imperial Army. Fred’s early years around Pinjarra in Western Australia were tough. The son of a drunkard railway-sleeper cutter and a sickly mother, he was born in 1920. By the time he was eight, he and his four brothers and one sister had been removed from their parents and sent to live in institutions in Perth after their mother contracted tuberculosis. Fred, the second youngest, was sent to a Salvation Army Boys Home in the inner-city suburb of Nedlands. It was a grim existence and 92-year-old Fred recalls, with the clarity of someone who has known real hunger, being permanently famished and having cracked feet in winter because he had no shoes. ‘Just like that,’ he says. At 14 Fred was sent to work on a poultry farm. He lasted six months, sleeping in the feed shed and eating in a corridor of the main house, never at the table of the farm owners. One day he said, ‘I’m sick of working my guts out for you, I’m going back to the home.’ So he went back to Nedlands and they immediately sent him to another farm as virtual slave labour. His second job was on a mixed farm where at least he was taught some skills, including harnessing and driving a team of eight horses. The sleeping arrangements were no better and he dossed down in a flea-ridden hessian bed as he “as he toiled six days a week for the paltry sum of two shillings. The only reason he got Sundays off was so he could wash his clothes. At 17 Fred was finally reunited with two of his brothers, Jack and Charlie, and the trio worked an unsuccessful mining lease together before they went travelling, jumping freight trains, with all their worldly goods, including the mandatory frying pan in a sugar bag, slung over their shoulders. Eventually Charlie got a job on a dairy farm in Coolgardie and Fred snared a start as a general hand in a boarding house in Kalgoorlie for ‘ten bob’ a week and his tea. 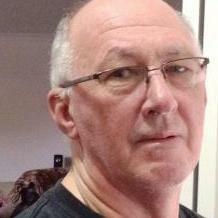 His next job was as a barman in a pub at Leonora, where there was a nickel rush on. After returning for a “brief stint in the mines, Fred eventually made his way back to Perth and enlisted in the army in May 1941. 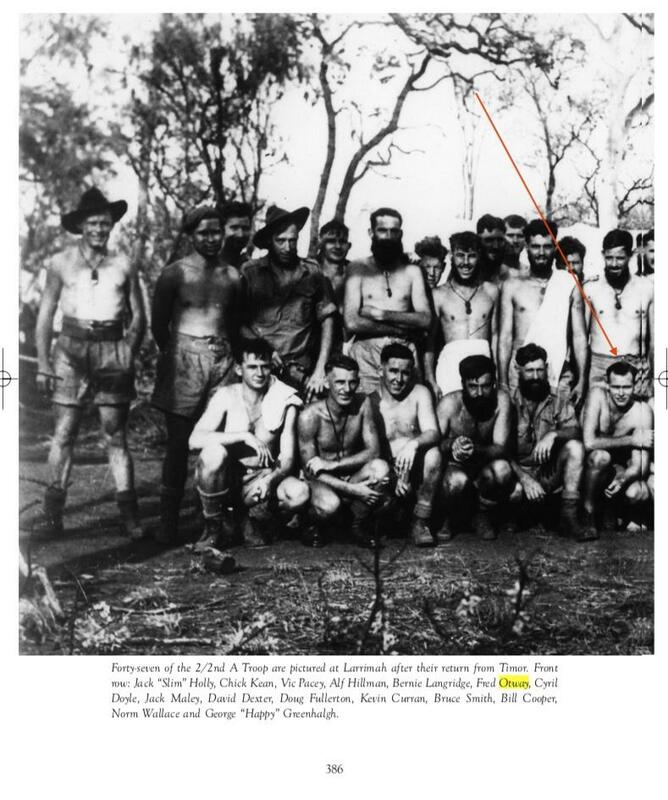 Due to his bush upbringing and his ability to live off the land, he was transferred from the training camp at Northam north of Perth across to the 2/2nd Independent Company at Wilsons Promontory in Victoria. The British commandos ran a training camp there to teach fresh recruits the dark arts of commando warfare — from demolitions and hand-to-hand combat to guerrilla warfare and how to recruit and train the locals. Fred says the 2/2nd was very different from any other unit in the Australian Army. He didn’t like the rigid formality and spit-and-polish traditions of the ‘big army’, but he loved the informal approach of the commandos. ‘In the 2/2nd you might be a captain, but you are just Bill or Tom, that’s all, nothing else, just one of us, we were all the same. Each depended on the other, none of this bloody army stuff saluting, yes sir, none of that stuff,’ he says. ‘We were free and easy, and the unit was allowed to do what it liked, “The 350 or so Australian commandos joined other allied fighters from the 2/40th Battalion and British and Dutch units to form Sparrow Force, which would harass and occupy an entire Japanese division in Timor for a year. Unfortunately, the army’s knowledge of tropical diseases was rudimentary at best, and the men, dressed in shorts and light shirts, succumbed en masse to malaria. Just before the Japanese arrived in Timor in late February 1942, the commandos decided to leave Dili and head for a healthier environment in the hills to the south of the capital. The town is built on a narrow coastal strip and immediately behind the built-up area the mountains rise almost vertically to provide a natural barrier to the interior and the island’s south coast. The high ridges overlooking Dili made ideal observation posts for the diggers and their comrades, who included local fighters drafted to the cause. Visitors to Dili today can clearly see how vital the high ground was to the Aussie guerrillas of Sparrow Force by visiting the Commando Memorial at the village of Dare high above the town. The views from the memorial to the 2/2nd Company (double red diamond insignia “ 2/40th Battalion [i.e. 2/4 Company] (double blue diamonds) and their local helpers take in a panorama of the coastline, the town and the roads leading up into the hills. During the East Timor independence battles in 1999 the Dare area would once again take on crucial tactical significance as Australian troops moved inland in pursuit of pro-Jakarta militia thugs. Following some alcohol-fuelled skylarking in the town prior to the Japanese invasion, the Australians had been banned from taking their rifles into Dili, and they only found out the enemy had arrived when a supply truck carrying 17 diggers was intercepted by a Japanese patrol. The men were all shot and bayonetted, and only one, Keith Hayes, escaped with his life. He was treated and sheltered by locals, including a middle-aged woman called Donnabella Martins, who nursed him back to health using mudpacks and banana leaves to heal his wounds. The Australians eventually split into small bands of guerrilla fighters and would spend most of 1942 and 1943 killing and harassing the enemy across East Timor. “You can do plenty of damage even if there is only four or five of you,’ Fred says. ‘As a guerrilla fighter there are certain rules to be observed and number one is you cannot exist without the support of the civilian population. You don’t interfere with them, you don’t interfere with their women, you don’t interfere with their customs and if you want food, you pay for it, which the Japs didn’t do. The threat of death or torture didn’t deter most of the hardy and God-fearing East Timorese, who remained loyal to the Aussies throughout the war. “Many veterans of Sparrow Force spent decades after the war fighting for justice for the East Timorese people in return for their vital help in the campaign to save Australia. In 1999 the Prime Minister, John Howard, provided the ultimate ‘thank you’ when he encouraged the Indonesians to leave the island and the international community to step in and to help bring independence to East Timor (Timor Leste). During its year-long guerrilla campaign, Sparrow Force killed about 1700 Japanese troops and delayed Japan’s eastwards advance. Fred Otway took to army life like a duck to water. Finally, at the age of 21, he had found a home. After returning from Timor and with yet another serious bout of malaria under his belt, Fred was sent to New Guinea in June 1943 to chase and harass the Japanese again. From Port Moresby the men of the 2/2nd were flown up to a place called Bena Bena near Goroka in the Highlands where the Japanese were expected to try and take the airstrip in order to attack American bombers on their runs from Port Moresby to Wewak. ‘Our task was to give the impression that we were 2000 strong “rather than 200,’ Fred says. They accomplished their mission and the Japanese force withdrew towards the north coast. About this time, he got word that his old commanding officer from Timor, Captain Dave Dexter, who had been seriously wounded in New Guinea and had joined ‘Z’ Special Unit in Melbourne, was looking for volunteers. Regarded as a fine officer, Dexter was well liked and trusted by the men, so in October 1944 Fred and eight of his mates from the unit decided to make the move. After completing parachute and submarine training and learning how to operate a variety of boats, Fred Otway was sent back to Timor to train the locals and to “observe the Japanese, who by then controlled the island. Some Portuguese didn’t want to leave, and they took the Japanese at their word that they would be placed in a secure enclave and looked after. Fred says it was nothing more than a concentration camp and many Portuguese, including five children, starved to death or succumbed to disease. Despite being from a neutral country, nine Portuguese soldiers were executed during his time there. Looking back, Fred says he enjoyed being in East Timor because he regarded it as a civilised place when compared with New Guinea. After the war, Fred Otway retrained as a painter and decorator, and in 1956 he moved to Brisbane where he settled with his family. A motorcycle accident put paid to his ambition to be a politician, so he spent the next 22 years working for the Queensland Government. This project was first planned in 1942 in conjunction with Lagarto, for the insertion of a party into the western districts of Portuguese Timor under the leadership of Sr A. da Sousa Santos who had been administrator of Fronteira Province. The insertion in the original plan called for the cooperation of Dom Alexio, a ruling chief of the western districts and to get his good will, a party of 4 members of PORTOLIZARD was despatched from the Dilor area about June 1942. A month later it was learned that the PORTOLIZARD men had been killed and that Dom Alexio and his family had been massacred. In these circumstances, the project was suspended. From time to time thereafter it was revived, first under the name STARLING as a division of the SOUNDER plan and last as a division of SUNFISH when it was renamed SUNDOG or SUNFISH D.
The purpose of the project was to set up a HQ in the vicinity of Ramelau Range in the Bobonaro district from which intelligence, propaganda and resistance activities could be carried out. Insertion was to be performed by ML’s in the vicinity of the mouth of the Be Lulic River on the south coast. Following disaffection among the Portuguese and Timorese personnel and in particular to their failure to volunteer to serve under Santos, in March 1945 the party was completely recast, Australian personnel being substituted for the Portuguese. Shand and Hartley were omitted from the party, the former joining SUNABLE. was allotted the task of making the initial landing and of assisting the main party to land and cache its stores. On 6 June 1945, the party sailed from Darwin in HMAS ‘Seasnake’ (Lt D. Jarvis. RANVR). On 8 June, the vessel closed the south coast of Timor in the vicinity of the mouth of the Sue River, the approach being made in poor weather some hours ahead of the scheduled time. As the mountains were cloud covered, the position of the vessel could not be fixed and at about 1500 hours, when probably less than 10 miles off the coast, columns of smoke were seen on the land. These were interpreted as smoke signals advising the approach of the vessel and the success of the mission was considered prejudiced thereby. The landing was therefore abandoned and ‘Seasnake’ returned to Darwin. The difficulties of navigation were underestimated in planning this operation. At the same time, while the exact position of the vessel off the Timor coast was not known, its distance offshore was capable of better estimation. The precipitate approach in broad daylight was highly prejudicial. However, in the circumstances, withdrawal was the only logical procedure. The mission was replanned to leave Darwin on 17 June. On 15 June, Advanced HQ of SRD instructed that the insertion of the party was to be preceded by a raid for the extraction of natives for interrogation. The arrangements which had already been made were adopted for the raid, which was given the name SUNDOG RAID. The personnel of SUNDOG were allotted to SUNDOG RAID with the addition of Dr Carlos Brandãoas interpreter and adviser on native matters. The party left Darwin aboard ‘Seasnake’ on 19 June 1945 and landed at the mouth of the Sue River at 2130 hours on the night of 21 June. The support party under Captain Florence made the initial landing and then held the beach head while the main raiding party under Lt Austin moved inland. The raiding party was unable to locate the village for which it was aiming. While reconnoitring, the party discovered a number of fresh tracks of enemy patrols and heard a rifle shot. Dr Brandão advised the party that on hearing the shot, the natives in the vicinity would have gone into hiding and considering that the discovery of natives in these circumstances was most unlikely, the raid was abandoned. The whole party re-embarked on ‘Seasnake’ at 2305 hours and sailed for Darwin. The operation BRIM was originally planned for the purpose of extracting SUNCOB party from the south coast of Portuguese Timor by surface craft. The plan was based on the Emergency Procedure of SUNCOB and took effect on the sighting of rather doubtful ground signals reported by search aircraft on 20 July. These ground signals, calling for extraction, were seen in the vicinity of one of the alternative extraction points prescribed in the SUNCOB plan, namely at the mouth of the Jre Bere River on the south coast. The extraction was arranged for the night of 28-29 July 1945, being the prescribed 8 days after the sighting of the ground signal, and an additional visit by the extraction craft on the following night was provided for. While the planning was in progress, ‘Krait’ returned from the unsuccessful LAGARTOUT mission for the extraction of SUNLAG and after interrogating the LAGARTOUT party, it was arranged to extend the BRIM plan to enable [the] extraction vessel to visit the extraction points of both SUNCOB and SUNLAG on each of the two nights. At the suggestion of NOIC, Darwin HDML 1324 of the RAN was detailed for the task with Sub Lt Bramley as extra navigator. A boat party comprising Lt J. Crombie (Leader), Sgts Boyle C.D. (2 i/c), Reid L.A., Otway, F.A., Gnr Hugo J. and Pte Young G. (all AIF) were allotted as boat party and were equipped with one 2-man rubber boat, one 7-man fitted with outboard and a spare 7-man boat. The intention was for Lt Crombie in the 2-man boat to proceed ashore as scout leaving the rest of the party in a 7-man boat outside the surf. On contacting the party ashore, Crombie was to ferry them through the surf to be picked up by the 7-man. When the plan had been finalised, broadcast messages were sent to both SUNCOB and SUNLAG giving them the essential details of the plan, in the hope that although they were not in contact by wireless, they might be keeping listening watch. HDML 1324 sailed from Darwin with BRIM party on 27 July 1945. On the afternoon of the 28th a signal reached Darwin from SUNLAG acknowledging the broadcast message but requesting that the extraction be delayed until 1st August as the party could not reach the rendezvous any earlier. By this time the ML was approaching the rendezvous point of SUNCOB. By arrangement with NOIC Darwin the vessel was recalled and returned to a sheltered anchorage at Snake Bay, Melville Island. SUNCOB later deferred to the rendezvous to the 3rd August to the 5th August and the ML returned to replenish fuel, water and stores. The vessel with BRIM party aboard finally left Darwin on the afternoon of 3rd August 1945 under a revised plan which provided for a rendezvous with SUNLAG at dawn on 5th August at the mouth of the Dilor River. When off this point at 0600H on the 5th SUNLAG’s flares were seen on the shore. The ML approached within 150 yards of the beach and launched the boats at 0615H. Owing to breaking its towline the 2-man boat with Lt Crombie was last to reach the beach. SUNLAG party with one native prisoner was waiting on the beach and was ferried off immediately to the ML which was reached at 0640H. After taking the boats aboard the vessel sailed for Darwin at 0645H arriving at LMS on the evening of 6th August. The success of this mission as compared with LAGARTOUT is ascribed to the time of the rendezvous being at dawn with the immeasurable benefit of the light and to the more seaworthy and commodious nature of the vessel used. The success however was due in a very large measure to the excellence of the signals communication maintained by SUNLAG’s signaller, Sgt Dawson, which permitted all details of the extraction to be worked out between the party and base. It is significant that whereas [the] SRD vessel had been operating off the Timor coast alone the HDML was provided with the AMS ‘Parkes’ as support standing 50 miles off Timor and fighter aircraft were at immediate standby in Darwin. The decision to withdraw the ML when within striking distance of SUNCOB’s extraction point on 28th July was based on the positive nature of the SUNLAG extraction and the indefinite nature of that of SUNCOB. It proved a most fortunate decision as the Japanese having captured SUNCOB and received the broadcast message had a strong reception party with light artillery waiting at one of the two alternative emergency evacuation points of the SUNCOB party. I was privileged to have met and interviewed Fred Otway back in 2012. Personally I found him to be a lovely bloke, quick with a smile, had a vivid memory and was sharp as a tack.